A television program (British English: programme) is a segment of content intended for broadcast on over-the-air, cable television, or Internet television, other than a commercial, trailer, or any other segment of content not serving as attraction for viewership. It may be a single production, or more commonly, a series of related productions (also called a television series or a television show). A limited number of episodes of a television show may be called a miniseries or a serial or limited series. Series without a fixed length are usually divided into seasons (U.S.) or series (UK), yearly or semiannual sets of new episodes. While there is no defined length, U.S. industry practice has traditionally favored longer television seasons than those of other countries. A one-time broadcast may be called a "special", or particularly in the UK a "special episode". A television film ("made-for-TV movie" or "television movie") is a film that is initially broadcast on television rather than released in theaters or direct-to-video. Television programs may be fictional (as in comedies and dramas), or non-fictional (as in documentary, news, and reality television). It may be topical (as in the case of a local newscast and some made-for-television movies), or historical (as in the case of many documentaries and fictional series). They could be primarily instructional or educational, or entertaining as is the case in situation comedy and game shows. A drama program usually features a set of actors playing characters in a historical or contemporary setting. The program follows their lives and adventures. Except for soap opera-type serials, many shows especially before the 1980s, remained static without story arcs, and the main characters and premise changed little. If some change happened to the characters' lives during the episode, it was usually undone by the end. (Because of this, the episodes could be broadcast in any order.) Since the 1980s, there are many series that feature progressive change to the plot, the characters, or both. For instance, Hill Street Blues and St. Elsewhere were two of the first American prime time drama television series to have this kind of dramatic structure, while the later series, Babylon 5, is an extreme example of such production that had a predetermined story running over its intended five-season run. In 2012, it was reported that television was growing into a larger component of major media companies' revenues than film. Some also noted the increase in quality of some television programs. In 2012, Academy-Award winning film director Steven Soderbergh, commenting on ambiguity and complexity of character and narrative, stated: "I think those qualities are now being seen on television and that people who want to see stories that have those kinds of qualities are watching television." When a person or company decides to create a new series, they develop the show's elements, consisting of the concept, the characters, the crew, and cast. Then they offer ("pitch") it to the various networks in an attempt to find one interested enough to order a prototype first episode of the series, known as a pilot. Eric Coleman, an animation executive at Disney, told an interviewer, "One misconception is that it’s very difficult to get in and pitch your show, when the truth is that development executives at networks want very much to hear ideas. They want very much to get the word out on what types of shows they’re looking for." To create the pilot, the structure and team of the whole series must be put together. If the network likes the pilot, they pick up the show to air it the next season (usually Fall). Sometimes they save it for mid-season, or request rewrites and further review (known in the industry as development hell). Other times, they pass entirely, forcing the show's creator to "shop it around" to other networks. Many shows never make it past the pilot stage. If the show is picked up, the network orders a "run" of episodes—usually only six or 13 episodes at first, though a season typically consists of at least 22 episodes. (The midseason seven and last nine episodes are sometimes called the "mid-seven" and "back nine"—borrowing the colloquial terms from bowling and golf). The method of "team writing" is employed on some longer dramatic series (usually running up to a maximum of around 13 episodes). The idea for such a program may be generated "in-house" by one of the networks; it could originate from an independent production company (sometimes a product of both). For example, the BBC's long-running soap opera EastEnders is wholly a BBC production, whereas its popular drama Life on Mars was developed by Kudos in association with the broadcaster. However, there are still a significant number of programs (usually sitcoms) that are built around just one or two writers and a small, close-knit production team. These are "pitched" in the traditional way, but since the creator(s) handle all the writing requirements, there is a run of six or seven episodes per series once approval has been given. Many of the most popular British comedies have been made this way, including Monty Python's Flying Circus (albeit with an exclusive team of six writer-performers), Fawlty Towers, Blackadder and The Office. 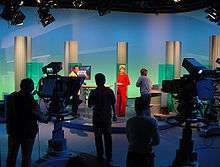 At the production company, which is often separate from the broadcaster, the executive producer, often the show's creator, is in charge of running the show. They pick the crew and help cast the actors, approve and sometimes write series plots (some even write or direct major episodes). Various other producers help to ensure that the show runs smoothly. After production, the show is turned over to the television network, which sends it out to its affiliate stations, which broadcast it in the specified broadcast programming time slot. If the Nielsen ratings are good, the show is kept alive as long as possible. If not, the show is usually canceled. The show's creators are then left to shop around remaining episodes, and the possibility of future episodes, to other networks. On especially successful series, the producers sometimes call a halt to a series on their own like Seinfeld, The Cosby Show, Corner Gas, and M*A*S*H and end it with a concluding episode, which sometimes is a big series finale. On rare occasions, a series that has not attracted particularly high ratings and has been canceled can be given a reprieve if DVD sales have been particularly strong. This has happened in the cases of Family Guy in the U.S. and Peep Show in the UK. If the show is popular or lucrative, and a number of episodes (usually 100 episodes or more) are made, it goes into broadcast syndication (in the United States) where rights to broadcast the program are then resold. In North American television, a series is a connected set of television program episodes that run under the same title, possibly spanning many seasons. Since the late 1960s, this broadcast programming schedule typically includes between 20 and 26 episodes. (Before then, a regular television season could average out to at least 30 episodes.) Up until the 1980s, most (but certainly not all) new programs for the broadcast networks debuted in the "Fall Season", which ran from September through March and nominally contained from 24 to 26 episodes. These episodes were rebroadcast during the Spring (or Summer) Season, from April through August. Because of cable television and the Nielsen sweeps, the "fall" season now normally extends to May. Thus, a "full season" on a broadcast network now usually runs from September through May for at least 22 episodes. Nowadays, a new series is often ordered (funded) for just the first 10 to 13 episodes, to gauge the audience interest. If it is "picked up", the season is completed to the regular 20 to 26 episodes. A midseason replacement is an inexpensive short-run (10–13 episode) show designed to take the place of an original series that failed to garner an audience and has not been picked up. A "series finale" is the last show of the series before the show is no longer produced. (In the UK, it means the end of a season, what is known in the United States as a "season finale"). Australian television does not follow "seasons" in the way that U.S. television does; for example, there is no "fall season" or "fall schedule". For many years, popular night-time dramas in Australia would run for much of the year, and would only go into recess during the summer period (December–February, as Australia is in the Southern Hemisphere), when ratings are not taken. Therefore, popular dramas would usually run from February through November each year. This schedule was used in the 1970s for popular dramas including Number 96. Many drama series, such as McLeod's Daughters, have received in the majority of between 22 and 32 episodes per season. Typically, a soap opera such as Home and Away would begin a new season in late January and the season finale would air in late November, with 220–230 episodes per season. However, during the Olympics, Home and Away would often go on hiatus, which is referred to as an "Olympic cliffhanger". Therefore, the number of episodes would decrease. This is no longer the case, as the Olympics no longer broadcast in winter on the Seven Network as of 2012. Australian situation comedy series' seasons are approximately 13 episodes long and premiere any time in between February and November. British shows have tended toward shorter series in recent years. For example, the first series of long-running science fiction show Doctor Who in 1963 featured forty-two 25‑minute episodes, this dropped to 25 by 1970 to accommodate changes in production and continued to 1984. For 1985 fewer but longer episodes were shown, but even after a return to shorter episodes in 1986, lack of support within the BBC meant fewer episodes were commissioned leading to only fourteen 25‑minute episodes up to those in 1989 after which it was cancelled. The revival of Doctor Who from 2005 has comprised thirteen 45‑minute installments. However, there are some series in the UK that have a larger number of episodes, for example Waterloo Road started with 8 to 12 episodes, but from series three onward it increased to 20 episodes, and series seven will contain 30 episodes. Recently, American non-cable networks have also begun to experiment with shorter series for some programs, particularly reality shows, such as Survivor. However, they often air two series per year, resulting in roughly the same number of episodes per year as a drama. The usage of "season" and "series" differ for DVD and Blu-ray releases in both in Australia and UK. In Australia, many locally produced shows are termed differently on home video releases. For example, a set of the television drama series Packed to the Rafters or Wentworth is referred to as "season" ("The Complete First Season", etc. ), whereas drama series such as Tangle are known as a "series" ("Series 1", etc.). However, British-produced shows such as Mrs. Brown's Boys are referred to as "season" in Australia for the DVD and Blu-ray releases. In the UK, most British-produced shows are referred to as "series" for DVD and Blu-ray, except for shows such as the drama series Hex and Echo Beach, which are known as "season". "Season" is only used for releases of American, Australian, and international shows. Although, in the past when an American series was released, it was referred to as "series", for example, Friends: Series 1. However, any subsequent re-release are now known as "season". In the United States, dramas produced for hour-long time slots typically are 39 to 42 minutes in length (excluding advertisements), while sitcoms produced for 30-minute time slots typically are 18 to 21 minutes long. There are exceptions as subscription-based TV channels (like Showtime) have episodes with 45 to 48 minutes of program, similar to Britain. In Britain dramas run from about 45 to 48 minutes, with 57 to 59 minutes on BBC1. Sitcoms vary greatly and are between 22 and 27 minutes generally and 27 to 29 minutes on BBC1. The longer duration on the national television channels (BBC1 and BBC2) is due to the lack of advertising, requiring time only for bridging commentary and trailers in each program slot. ↑ "Hill Street Blues A Cop TV Turning Point". Mysterynet. ↑ Lang, Brent (June 6, 2012). "Why Television Is Trouncing Film at Major Media Companies". TheWrap.com. ↑ Zakarin, Jordan (June 29, 2012). "Steven Soderbergh Hints at Switch to Television". The Hollywood Reporter. ↑ Carter, Bill (April 4, 2010). "Weighty Dramas Flourish on Cable". The New York Times. Retrieved October 18, 2011. ↑ Fernandez, Sofia M. (September 26, 2011). "'Pan Am' Among Season's Priciest Pilots". The Hollywood Reporter. Retrieved October 19, 2011. ↑ Barnes, Brooks (August 28, 2011). "Prime Time Ambitions". The New York Times. Retrieved October 19, 2011. ↑ Lotz, Amanda (2007). The Television will be Revolutionized. New York and London: New York University Press. pp. 82–85. 1 2 Storey, Michael (2009-04-23). "THE TV COLUMN: Not in 18–49 age group? TV execs write you off". Arkansas Democrat Gazette. Retrieved 2008-05-02. ↑ Carter, Bill (April 6, 2010). "An 'Idol' Ratings Loss, but Not in Its Pocketbook". The New York Times. Retrieved April 8, 2010. ↑ "ABC, "Dancing with the Stars" Again Top Monday Television Ratings". City News Service. Beverly Hills Courier. Retrieved October 19, 2011. ↑ Santiago, Rosario (2007-10-03). "For Advertising Purposes, 'Grey's Anatomy' May Well be Colored Green". BuddyTV. Retrieved 2009-05-03. ↑ Steinberg, Brian (October 18, 2010). "Simon Who? 'Idol' Spots Still Priciest in Prime Time". Advertising Age. Retrieved October 28, 2010. ↑ Schneider, Michael (July 8, 2015). "Networks Put in Short Orders for Next Season". TVGuide.com. Retrieved August 14, 2012. ↑ March 25, 2007 Milwaukee Journal Sentinel article entitled, "Vacation's Over; 'the Sopranos' Returning for One Last Shot. ↑ June 24, 2011 Anniston Star article entitled, "Pop Cultured: When summer and the Braves get you down, just flip around.